Upon its debut in 2013, the Buick Encore quickly became a favorite in the luxury crossover market. Although considered a subcompact crossover, the 2019 Buick Encore has plenty to offer the luxury crossover buyer, inside and out. It has luxurious appointments on the inside, a more than capable engine perfect for city life and a ton of standard safety features. What’s more is that the 2019 Buick Encore includes all of this with a reasonable $23,200 MSRP price tag. Subcompact crossovers like the 2019 Buick Encore have become increasingly popular among drivers in the last several years. They combine the drivability of a sedan with the performance of a sport utility vehicle. They also have more interior room than most sedans and are smaller, thus easier to maneuver, than most SUVs. This is especially true of the 2019 Buick Encore. It is nearly three feet shorter than the Buick Enclave, its SUV cousin, making it much less clumsy and unwieldy in heavy city traffic. Those that spend a lot of time in urban traffic areas will certainly notice this deft maneuverability. More so than most subcompact cars in its class, however, the 2019 Buick Encore includes plenty of upscale interior appointments and safety features, all available on even the base model. Drivers looking for a reasonable luxury crossover with deluxe interiors in the Atlanta and Kennesaw area are invited to read on and see a little more about this beautiful vehicle. When you are done, head down to Carl Black Chevrolet Buick GMC Kennesaw and see a brand new 2019 Buick Encore in person. 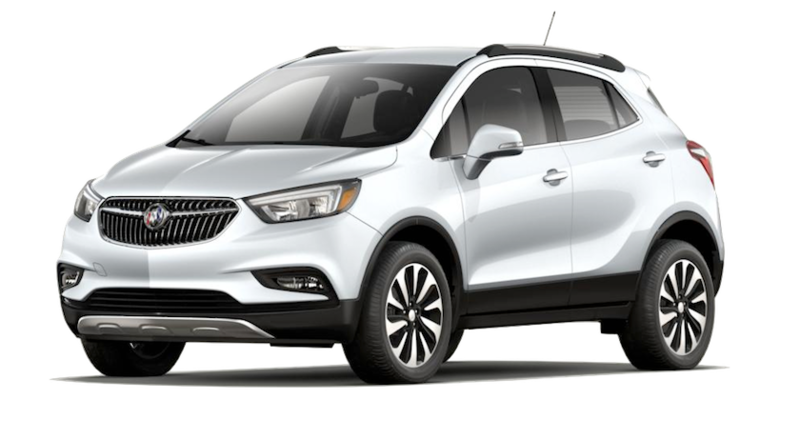 The 2019 Buick Encore features a base Inline-4 1.4 liter engine, capable of 138 horsepower. This is plenty of get up and go for living in a city environment. As mentioned before, the maneuverability the 2019 Buick Encore possesses pairs well with this small but capable engine. It isn’t best suited for high-speed highway driving or off-roading. But, you wouldn’t want to take a beauty of a vehicle like this too far off-road. Front Wheel Drive is standard on this vehicle, with All Wheel Drive available on higher trims. It features a six-speed transmission, which is perfect for city traffic. Additionally, the 2019 Buick Encore gets up to 27 miles per gallon in the city and 33 miles per gallon on the highway. That means you could get up to 434 miles on a single tank of gas. That’s almost seven times around I-285, if you were so inclined. The engine and motor in the 2019 Buick Encore are perfectly suited for a compact crossover. A slightly more powerful engine, capable of up to 145 horsepower is available on higher trims if that seems more to your liking. However, with a vehicle this size, you don’t need too much power or too much engine. Buick knows this and decided to save their designing prowess on a beautiful interior and strong safety features. When you look at photos of luxury vehicles, most of the pictures you will see is of the interior. While luxury also applies to exterior design and engine performance, luxury drivers spend far more time in the vehicle than under the hood or admiring the sleek design. The 2019 Buick Encore is a perfect example of this. Even though it has a beautiful structure and more than capable engine, the true luxury lies on the inside. With comfortable and spacious seating for five, the 2019 Buick Encore comes loaded with plenty of standard features that most base level trims on comparable vehicles do not. Some of these include one-touch power windows for all four windows, a rearview camera, Android Auto and Apple CarPlay connectivity, and a fold-flat front seat. Many other automakers would reserve perks like these for higher trim levels. Not Buick. When we said spacious seating for five, we meant it. The front seat of the 2019 Buick Encore has 39.6 inches of headroom and 40.8 inches of leg room. When sitting in the front bucket seats (which are also standard, by the way), that much room will make for a very comfortable ride. The back seat features 38.8 inches of headroom and 35.8 inches of leg room. As if that was not enough room, the entire cargo area of the 2019 Buick Encore is 48.4 cubic feet, once the (again, standard) fold-flat front passenger seat is down. So, if you have some lightweight but spacious cargo you need to get around Atlanta and Kennesaw, this crossover will look pretty appealing. One of the more innovative features that Buick has brought to the automotive world is their QuietTuning technology. By implementing such design methods as isolating the engine, installing laminate glass all over the Encore, adding extra layers of sound-muffling materials under the floorboards and other ingenious ideas, QuietTuning keeps extant noise out of the cabin, making riding in the 2019 Buick Encore, or any Buick for that matter, a truly serene experience. Great luxury items and appointments are not the only things that come standard on the 2019 Buick Encore. Along with its 5-star NHTSA rating, it comes with tons of standard features most base model crossover vehicles save for higher trim levels. Safety is an important aspect for crossover buyers, as these vehicles have become popular family cars. Buick understands that, and it does not gouge buyers for features they deem necessary to automobile safety. Automotive technology has taken huge strides in the last ten years. Safety is one of the areas where the greatest leaps have been made. Some of those newer innovations include stability control, which helps the driver maintain vehicle balance in the event control of the vehicle gets away from you; traction control, which gives the driver extra control on less than ideal road conditions, such as snow, sleet or gravel; emergency brake assist, which adds extra pressure at low speeds to help avoid collisions. All of these safety features are relatively new, vital to the modern driver, and all of them come standard on the 2019 Buick encore. Additionally, this Encore comes with plenty of airbags for both front and back seat passengers. In the unfortunate event of an accident, front and back seat passengers are protected by dual front and side head airbags. These airbags automatically inflate in a wreck and protect all passengers from all sides. As with all of the safety features mentioned, these airbags come standard. Buick clearly cares about the safety of its passengers and drivers. If you are in or around Kennesaw in the Greater Atlanta area, and you are interested in a beautiful, brand new luxury subcompact crossover at an affordable price, Carl Black Chevrolet Buick GMC Kennesaw has great news for you. The 2019 Buick Encore is everything you are looking for, and then some. This exciting new crossover has an engine perfectly suited for urban and suburban life, quality gas mileage, a spacious and luxurious interior with features to spare, and more safety features than you are likely to see come standard on many automobiles of any size or class. The 2019 Buick Encore comes in several different trim levels that we barely touched on here. We wanted to show you all the amazing features this vehicle has to offer at just the base level. Imagine what else the Encore can offer when you get to the higher trims such as the Preferred, Sport Touring, Preferred II, Essence and Premium. With all of those trim levels and different configurations and packages available, the 2019 Buick Encore has much more to offer than just what you have seen here. We invite you to come down to our showroom and speak with our sales representatives. They can show you the 2019 Buick Encore in the flesh, so you can see and feel all the luxury in person. After we have answered all of your questions, you are welcome to speak to our finance department. Here, we can walk you through any financing options, whether you are looking to lease or buy. We know this is a tricky process, and we are here to help you every step of the way. If you can’t make it to our showroom right away or if you prefer to do your online browsing past our open to close hours, we have a virtual showroom on our website. It shows you all the available vehicles we have, with prices, deals, trim levels, specs and so much more. You can also peruse parts and accessories, and see what we offer in the way of regular maintenance or repair. However, as great as the internet may be, nothing compares to seeing this vehicle (or any of our luxury Buicks) in person. Starting at only $23,200, the 2019 Buick Encore is sure to be a hot seller for Kennesaw and Atlanta area drivers. Don’t wait too long. Come on down. We are waiting for you!